Word of Mouth with Jim Wunderlich | Host Jim Wunderlich interviews a variety of captivating guests on Word of Mouth, a weekly live radio show. 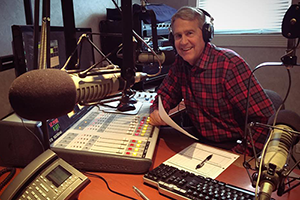 Host Jim Wunderlich interviews a variety of captivating guests on Word of Mouth, a weekly live radio show. Kalee Hooghkirk, a specialist at a medical cannabis dispensary in Mundelein, discuses the medicinal, psychological, and social advantages in prescribing marijuana to patients suffering from debilitating conditions. College of Lake County film professor Chris Cooling examines the winning formula of the Bond series and considers how the 007 movies have adapted to cultural trends spanning the 53 years from the premiere of Dr. No to the recent release of Spectre. Teri Dreher, an ICU nurse and owner of North Shore Patient Advocates, explains how to steer through today’s complex and rapidly changing health care system to obtain your best care. Beatles’ scholar and author, Aaron Krerowicz, examines how the Fab Four used innovative thinking and avant-garde techniques in recording historic songs from Abbey Road, Sgt. Peppers Lonely Hearts Club Band, and The White Album. After losing her left leg to bone cancer at age 14, Hailey Danisewicz overcame many hurdles to become a world champion paratriathlete. She shares her story with Jim. Ecologists Nan Buckhardt and Allison Frederick of the Lake County Forest Preserve District describe the recreational opportunities, health benefits, and the abundance of wildflowers and wildlife offered along the beautiful 31-mile Des Plaines River Trail. Noted historian, Barry Bradford, reveals stunning insights into the murder of our greatest President and the events that changed the nation. Welcome to Word of Mouth, a live weekly radio show hosted by Jim Wunderlich that invites you to visit with a variety of intriguing guests.